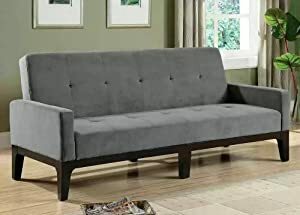 Sofa Bed Seat Height" 17"
Sofa Bed Seat Depth: 23"
This causal styled sofa bed is covered in a durable blue/gray microfiber fabric. Padded track arms and button tufted seating add to the casual styling. Exposed wood base is finished in cappuccino.